NEW DELHI, Dec 8  The Delhi Government has decided to get prepared a feasibility report on generating more power for the Capital which witnesses long hours of load-shedding in peak summer months. NEW DELHI, Dec 8  The Ethics Committee of the Rajya Sabha today suggested several measures including framing of a Code of Conduct for Members of Parliament for setting high standards of behaviour in public life. NEW DELHI, Dec 8  A White Paper on the activities of Pakistans Inter Services Intelligence in India will soon be tabled in Parliament, the Lok Sabha was informed today. NEW DELHI, Dec 8  Dr Amartya Sen, should be described as recipient of the Bank of Sweden Prize in Economic Services and not as a Nobel Laureate, a petition filed in public interest and likely to come up for hearing on December 16, seeks this direction to the media and all other concerned. NEW DELHI, Dec 8  Finance Minister Yashwant Sinha and 11 other BJP MPs today threatened to resign from their Lok Sabha seats if the government fails to introduce a Bill for creation of a separate Vananchal state carved out of Bihar during the current winter session of Parliament. NEW DELHI, Dec 8  A city consumer forum has directed Messrs Jaina Properties to give possession of a basement alongwith all title deeds to a person who had paid the entire amount. NEW DELHI, Dec 8  Two-year old multi-crore JMM MPs' bribery case took a new turn today with the Supreme Court agreeing to review its earlier judgement holding that MPs, who allegedly accepted bribe but voted in Parliament would be immune from prosecution. NEW DELHI, Dec 8  Mr Shanta Kumar, MP from Kangra, today demanded a new superfast train exclusively from Pathankot to Delhi and also a computerised reservation centre at Dharamsala or Nagrota. MUMBAI, Dec 8  Popular film comedian Johnny Lever was today convicted and sentenced to seven days' imprisonment for disrespect to the National Anthem and Constitution during a private performance in Dubai. PATNA, Dec 8  Tathagat Tulsi, a child prodigy, has broken yet another world record by passing the bachelor of science (physics), examination from the Science College of Patna University at an age of 11 years and two months, Patna University sources said. MUMBAI, Dec 8 The Mumbai High Court today asked the government to consider the withdrawal of prosecution against noted script writer Salim Khan, charged for keeping in captivity animals protected under the Wildlife Act. Power Minister Dr Narendra Nath today said that the Delhi Government planned to emphasise on solving the power crisis that gripped the city during the BJP rule. "Power is a major issue as people are directly affected. The summer of 1998 left the people crying for electricity and I do not want it to happen again," he said. The measures proposed by the feasibility study on more electricity generation will be taken before the summer sets in. During its election campaigns, Congress leaders accused the BJP of not adding a single unit of power during its five-year rule and relied only on the power generation capacity that was left behind by the Congress. Meanwhile, the Blueline owners today met the Chief Minister, Ms Sheila Dikshit, after it was announced that the transport department was planning to bring in more Blueline buses on city roads. The Blueline operators had earlier decided to vote against the BJP government in the polls for its "anti-bus" operators' policy. Transport Minister, Mr Parvez Hashmi had announced a complete reversal of the BJP governments policy of putting more Delhi Transport Corporation (DTC) buses on roads. The government policy would be to bring in more private buses on the roads as they were cheaper to run and that the Blueline buses would be allowed to ply, Mr Hashmi said. The Blueline operators expressed the hope that the new government would soon issue the five-year permit as directed by the Supreme Court. The new Health Minister, Dr A.K. Walia, stated today that Delhi would soon have its own "oral health policy" and the dental wing of Maulana Azad Medical College would be upgraded to a full-fledged dental college with masters in dental surgery facility. He said there was need to formulate strict oral health regulations for prevention of increasing dental diseases in a country like India where 90 per cent of the population suffers from periodontal diseases. Inaugurating a "dental health mela" here, Mrs Sheila Dikshit said the regulation policy should include prohibition of smoking at public places, ban on pan masala and enactment of statutory warning of Indian traditional sweets. NEW DELHI, Dec 8  The Ethics Committee of the Rajya Sabha today suggested several measures including framing of a Code of Conduct for Members of Parliament for setting high standards of behaviour in public life. The committee, in its first report presented to the Rajya Sabha, sought suitable changes in the law for breaking nexus between money power and elections, open ballot instead of secret ballot in elections to the Rajya Sabha and state legislative assemblies and review of questions of corporate funding of political parties and its ramifications. The committee has also desired that it should be made compulsory for MPs to declare their assets and liabilities and those of their immediate family that includes spouse, dependent daughters and dependent sons before the committee. The committee chairman, Mr S.B. Chavan said. The committee has also favoured political parties evolving "self-controlling norms" to regulate the conduct of those of doubtful integrity, Mr Chavan said, adding that "we do not favour the idea of subjecting the members to the disciplinary authority of an agency outside the jurisdiction of the House". The committee was constituted on March 4, 1997, with a broad mandate to oversee moral and ethical conduct of the members and to examine the cases referred to it with reference to their ethical and other misconduct. The report said the members should desist from giving certificates to individuals and institutions about which they had no personal knowledge and were not based on facts. Over the issue of disqualification of a member, the report has suggested that the government should expedite the process of initiating major electoral reforms in order to keep criminals out of political arena. "The committee strongly feels that donations received by political parties, the source of which lies in a foreign country should be totally banned", the report said. The report would now be discussed in the Rajya Sabha, Mr Chavan said, adding that a final code of conduct for members would emerge by the next year. NEW DELHI, Dec 8 (PTI)  Finance Minister Yashwant Sinha and 11 other BJP MPs today threatened to resign from their Lok Sabha seats if the government fails to introduce a Bill for creation of a separate Vananchal state carved out of Bihar during the current winter session of Parliament. In a letter to Prime Minister Atal Behari Vajpayee, the copy of which was released to the press here, they said the BJP in its election manifesto had promised the creation of Vananchal comprising 18 districts of Chotanagar and Santhal pargana in south Bihar. "We will be compelled to resign if the Bill is not introduced in the current winter session of Parliament," they said. Besides Mr Yashwant Sinha, other signatories to the letter include Rita Verma, Abha Mahato, Reetlal Prasad Verma, Babulal Marandi, Karia Munda, Dhirendra Agarwal and Ramtahal Choudhary. They said the BJP Vananchal samiti at its meeting at Ranchi in October had urged the government to introduce the Bill and it had organised meetings at block level to tell the people that Vananchal would be created during the winter session of Parliament. The Central party leadership, too, had been saying that the Bill would be brought forward during the winter session but now it appeared from the statements of Parliamentary affairs Minister M.L. Khurana that the issue had been shelved. In its order pronounced recently, the Tis Hazari Consumer Disputes Redressal Forum directed Jaina Properties in Daryaganj to pay as compensation Rs 5000 in addition to Rs 1000 spent by the complainant on litigation. The Bench held that the respondents had shown deficiency in service by not providing either possession of the basement and its title documents or refunding the money paid by the complainant. The Bench presided by Mr P.K. Jain and attended by members, Mr G.R. Gupta and Mrs Santosh Khanna have, however, given the respondents the option of refunding Rs 50,699.95 with 15 per cent interest from the date of each payment till realisation and litigation expenses of Rs 1000. In his complaint to the forum Mr Suresh Chand Jain, a resident of New Rohtak Road, stated that Jaina Properties did not give him possession of the space he booked in Jaina commercial complex in Preet Vihar in February 1986. Mr Jain said that although he had paid the entire amount, the property dealers ignored his repeated requests to hand over documents of possession or refund the entire amount. Mr Jain prayed that the respondents be directed to give possession of the said space with title documents or refund Rs 50,699.95 with interest. In his complaint, Mr Jain said that he paid an advance of Rs 2000 for booking the space and all instalments towards the total selling price of Rs 46,155. Apart from this, he paid registration, connection and fire fighting charges totalling Rs 50,699.95 till January 4, 1988. According to the order, the respondents took the preliminary objection that the complaint was time-barred. They also stated that they had written to Mr Jain on February 10, 1992 asking him to make the remaining payment and take possession of the basement. The respondents pointed out that they cancelled the booking made by Mr Jain through a letter dated May 15, 1992 after he failed to follow the terms and conditions. After hearing the two sides and examining documents, the Bench held that although the complainant paid the entire amount, the possession of the said space was not given to him. The Bench held that the objection of the respondents that the complaint was time-barred is not tenable. The Bench pointed out that since Mr Jain filed the complaint in the forum on November 22, 1994 and had sent a number of letters between August, 1992 and April, 1993 by registered post (copies of letters and postal receipts to the respondents on record) requesting for possession and then meeting the manager, it cannot be said that the cause of action was not alive. The forum held that the documentary proof of payments submitted by the complainant showed that the complainant paid all instalments and other charges totalling Rs 50,699.95 as per the terms and conditions of the agreement. The Bench further held that the respondents letters dated February 10, 1992 and May 15, 1992 do not make it clear which payment was outstanding on the basis of which they cancelled the booking. The Bench held that the complainant has pleaded that he did not receive these letters. "We are of the view that had he received these letters, he would definitely have raised the question of payment which he had already made. The complainant had already paid the entire dues in respect of which the respondents issued receipts (copies on record). Five per cent, of course, was to be made at the time of possession which was never given to the complainant." NEW DELHI, Dec 8 (PTI)  Two-year old multi-crore JMM MPs' bribery case took a new turn today with the Supreme Court agreeing to review its earlier judgement holding that MPs, who allegedly accepted bribe but voted in Parliament would be immune from prosecution. A five-judge Constitution Bench comprising Chief Justice A.S. Anand, Mr Justice S.P. Bharucha, Mr Justice K. Venkataswami, Mr Justice B.N. Kirpal and Mr Justice S. Rajendra Babu agreed to hear a petition filed by the Union Government seeking a review of the apex courts April 17 judgement. The earlier five-judge Bench had held that the MPs, who voted against a no-confidence against the then Narasimha Rao government on July 28, 1993, in Parliament after receiving bribe, would enjoy immunity from prosecution under Article 105(2) of the Constitution. The Bench had, however, held that those MPs, who accepted the bribe but did not vote were liable for prosecution along with the MPs who gave bribe. The Bench had also held that MPs were public servants under the Prevention of Corruption Act. From among the 21 original accused, the trial court had categorised bribe takers MPs  Shibu Soren, Suraj Mandal, Shailendra Mahato (later turning approver), Simon Marandi, Ram Lakhan Singh Yadav, Anadi Charan Das, Roshan Lal, Abhay Pratap Singh, Haji Ghulam Mohammed and Ram Sharan Yadav. In the category of alleged bribe-givers were former Premier P.V. Narasimha Rao, Satish Sharma, Buta Singh, Bhajan Lal and M. Veerappa Moily. However, Ajit Singh, who allegedly accepted the bribe but did not vote was also directed to face prosecution. The petitions filed by Rao, Buta Singh, Satish Sharma and others, seeking quashing of the charges framed against them by a special court, are at present pending before the Supreme Court. The earlier Constitution Bench headed by Mr Justice S.P. Bharucha had ruled that those MPs giving bribe would come under the Prevention of Corruption Act as MPs were public servants. The CBI had alleged that Rao in conspiracy with his Cabinet colleagues and others had bribed MPs from the then Jharkhand Mukti Morcha (JMM) and other parties to defeat a no-confidence motion against the Congress government. Mr Shanta Kumar, who called on the Railway Minister, Mr Nitish Kumar here today said people of these areas adjoining Pathankot were facing difficulty in boarding trains as these were full. Apart from easing the pressure, the new train from Pathankot, he said, would also give impetus to tourism in the Kangra valley. He also urged the ministry to open a computerised Railway reservation centre either at Dharamsala or Nagrota so that people residing in the areas could make reservation for various places from the centre. The General Manager of the Northern Railway, Mr S.P. Mehta, who was present at the meeting, agreed to add a few coaches to some important trains passing through Pathankot for which booking would be from Pathankot, a state government press release said today. Mr Mehta also assured to provide the facility of computerised reservation centre at the places suggested by Mr Shanta Kumar. The Railway Minister assured the MP that genuine demand of the state would be considered sympathetically by his ministry. MUMBAI, Dec 8 (UNI)  Popular film comedian Johnny Lever was today convicted and sentenced to seven days' imprisonment for disrespect to the National Anthem and Constitution during a private performance in Dubai. According to the police, Lever had performed at Hotel Hayat Regency in Dubai during the birthday celebrations of Anis Ibrahims son. Anis is the brother of underworld Don Dawood Ibrahim. During the show, the comedian mimicked and insulted the Indian National Anthem and the Constitution. He was tried under Section 2 of the Prevention of Insult to National Honour Act and sentenced by Additional Chief Metropolitan Magistrate K. Holambe-Patil after a video cassette capturing the performance live was produced before the court as evidence. The petitioners have also sought a direction to the West Bengal government and the Calcutta Municipal Corporation not to hold a civic reception on December 27, to honour Dr Sen as a Nobel Laureate, but they have no objection if reception was held for Dr Sen as winner of the Bank of Sweden Award in Economic Sciences, the petitioners have submitted in the petition. The petition has been filed by Dr S.C. Roy, a scholar from Moscow University in Nuclear Physics and Science Research Scholar from Rewa University in Madhya Pradesh. Mr Satya Prakash, the Union of India, Dr Amartya Sen, General Manager, Press Trust of India (PTI) Chief Editor and General Manager of United News of India (UNI), Calcutta Municipal Corporation are impleaded as respondents in the petition. The petitioners have contended that the Royal Swedish Academy was creating the confusion regarding the Nobel Prize in Economics, the award given to Dr Sen. According to the will of Dr Alfred Nobel, the Nobel Prize is given for five disciplines which do not include Economics. The award in Economics is a memorial award in memory of Dr Alfred Nobel and no winner of this award till today including Dr Sen can be called a Nobel Laureate. They have further submitted in the petition that though it was the highest award in Economics and equivalent to Nobel Prize, and is given at the same function, yet the medal is slightly different from the Nobel Prize and the logo of the donor bank is inscribed on it apart from Dr Nobels emblem. NEW DELHI, Dec 8 (PTI)  A White Paper on the activities of Pakistans Inter Services Intelligence (ISI) in India will soon be tabled in Parliament, the Lok Sabha was informed today. Replying to a spate of supplementaries during question hour on ISI activities, Home Minister L.K. Advani said the agency, after suffering a setback in Punjab, had spread its tentacles in different parts of the country. To tackle ISI-sponsored militancy, the government had adopted a multi-pronged approach, he said. The government had information that the ISI was considering making Nepal a base for its activities in India and New Delhi was in touch with the Nepal Government, the Home Minister said. A close watch was being kept on the channels through which the ISI was inducting and training people and steps were being taken to stop it, he said. On the Coimbatore bomb blast case, Mr Advani said a charge sheet had been filed and the principal accused were facing trial. The Tamil Nadu Government was pursuing the case earnestly and the Centre was being kept informed of the developments, he said. Asked if the Al-Umma outfit would be banned in the country, the minister said the need for such a measure had not yet arisen. Mr Advani said periodic meetings with state governments and the security agencies were held to share information and devise strategies to counter ISI activities and, depending upon the requirement, joint operations were launched. PATNA, Dec 8 (PTI)  Tathagat Tulsi, a child prodigy, has broken yet another world record by passing the bachelor of science (physics), examination from the Science College of Patna University at an age of 11 years and two months, Patna University sources said. Tathagat, a mathematical wizard, has surpassed Jay Luo of Garden City, USA, who had earlier succeeded in finding a place in the Guinness Book of World Records by graduating in science from Boise State University, Idaho, at the age of 12 years one month and 12 days. Tathagat carved the niche for himself by passing out the B.Sc honours examination from Patna University by appearing simultaneously in all three parts of the honours course. He secured over 70 per cent marks. The results were declared yesterday. He had been able to register his name in the Guinness Book of World Records in 1997 by passing out the CBSE examination at the age of nine years and six months. He was allowed to appear in the B.Sc examination on the directive of the Patna High Court. Tathagat when, contacted, expressed confidence that after B.Sc honours he would pass the M.Sc (physics) examination "next year to create another world record". MUMBAI, Dec 8 (PTI) The Mumbai High Court today asked the government to consider the withdrawal of prosecution against noted script writer Salim Khan, charged for keeping in captivity animals protected under the Wildlife Act. The courts suggestion came after Khan, who was found to possess a black buck, two spotted deer and a peahen at his farmhouse in nearby Panvel Taluka, unfolded before the court a scheme to safeguard the flora and fauna of the country. Accepting the scheme, Mr Justice F. I. Rebello also noted in his order that in case Salim was prosecuted, the magistrate of the trial court should take into account the offer made by the script writer to protect the flora and fauna. The court had on November 7 confirmed the interim bail of Khan but directed him to evolve a scheme to protect environment and endangered species. Khan had sought anticipatory bail following a search on October 15 by the Forest Department at his farmhouse where the animals were found confined in a closed room. In his three-fold scheme, Khan announced that he would undertake afforestation by planting and nursing 500 trees in his farmhouse with the help of his three sons  Salman, Arbaz and Sohail  associated with film industry. In this task, he would involve school children to bring environmental awareness among them. NEW DELHI, Dec 8  The Medical Officers Association of the Employees State Insurance Corporation has threatened to go on strike if its demand for a transparent transfer policy is not met soon. The national coordinator of the Service Doctors Wing of the Indian Medical Association, Dr P K Jain, said here yesterday that the association would serve notice of an agitation to the Director General, ESIC, if an amicable solution is not reached by December 12. The IMA has also criticised the ESICs action on frequent transfers of IMOs from one state to another. NEW DELHI, Dec 8 (PTI)  A ruling party member in the Lok Sabha today created a mild flutter when he sat on dharna, protesting against rising prices of vegetables, pulses and other commodities and exorbitant rates of urea and di-ammonium phosphate (DAP). Stating that the issue was very serious, Mr Gangacharan Rajput of the BJP said during zero hour that farmers across the country had been also affected by the non-availability of manures. NEW DELHI, Dec 8 (PTI)  A special unit has been set up in the CBI for the exclusive investigation of counterfeit currency and the Border Security Force (BSF) alerted to check the smuggling of fake notes from across the border, Lok Sabha was told today. So far, fake currency valued at about Rs 24 lakh was seized till September this year from various parts of the country, including about Rs 5.6 lakh from Delhi. NEW DELHI, Dec 8 (PTI)  The Government is yet to take a final decision on bringing in a Bill to provide full statehood to Delhi in Parliament, the Lok Sabha was informed today. The Centre has still not taken a final view in the matter, Home Minister L.K. 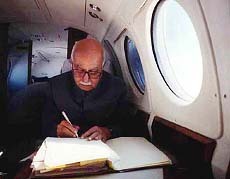 Advani said in a written reply. HYDERABAD, Dec 8 (PTI) Before the seeds of dissent on Monsantos terminator gene could germinate into a major controversy, the Andhra Pradesh Government has taken the lead in banning all field tests by the US multinational in bollgard cotton crop after irate farmers set ablaze the crop at a Warangal trial centre. Trouble started with farmers and some non-governmental organisations (NGOs) protesting against Monsanto experiments on bollgard seeds, which according to them were a cover up bid to introduce terminator gene, a one-time use seed, by killing its reproduction capacity to enable MNCs capture the seed market.